Ralph Taft Merrill, 86, of Pleasant Grove passed away Monday, July 16, 2018. He was born July 15, 1932 in Pocatello, Idaho to Rufus Taft and Florence Larsen Merrill. He married the love of his life Joan Nadine Brown in Pocatello, Idaho and they were sealed together as an eternal family November 27, 1957 in the Salt Lake Temple. Ralph grew up in Pocatello, Idaho and graduated from Pocatello High School in 1950. He served in the Us Navy on the USS R Renshaw during the Korean War and operated the ships sonar. He attended Brigham Young University and graduated with both B.S. and Masters degrees in Electrical Engineering. He worked for DOW Chemical, Boeing, and Becton Dickenson and many other tech companies in the industry during his career. Ralph found his true calling as the Dean of the Electronic Technology Department at UVSC where he mentored students to find their career path and develop their skills and talents. He was a devoted member of the Church of Jesus Christ of Latter-day Saints and served faithfully as a Stake Clerk for over 20 years. 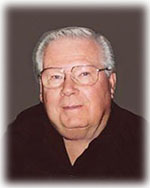 He is survived by his five children: Russell (Laurie) Merrill, Jeffrey (Cindy) Merrill, Steven (Tori) Merrill, Douglas (Camille) Merrill and Melinda (Charles) O’Neal; eleven grandsons and nine granddaughters; nine great-grandson and eight great-granddaughters; brother, Paul (Rae Ann) Merrill. He was preceded in death by his wife Joan, parents and sister, Janet Merrill Savoy. Funeral services will be held Monday, July 23, 2018 at 11:00 a.m. in the Pleasant Grove East Stake Center, 825 South Loader Drive, Pleasant Grove, where family and friends may attend a viewing from 9:30 – 10:30 a.m. prior to the services. Interment will be in the Pleasant Grove City Cemetery. Military honors will be conducted by American Legion Post 72. Condolences may be sent to the family at www.olpinmortuary.com.